Come to the dark side...we have worms. I’ve been fishing tenkara and other fixed line methods almost exclusively for the past few years. I’ve reserved fly rod and reel fishing almost exclusively for warmwater fish like largemouth bass and carp. Unlike many tenkara acolytes, I don’t view it as a total replacement for all fly fishing needs. In fact, I’ve experienced the opposite: tenkara has reignited my passion for rod and reel fly fishing! One of the things that I always found frustrating in fly fishing was my inability to make those long “glory” casts. You know, those 100 foot casts with a super tight loop that lays out just perfectly. I spent way too much time trying to learn to cast far without thinking about presentation or approach. Lately, I’ve discovered the ease of two-handed (aka Spey) casting. I now have a 6-weight switch rod set up with an OPST Commando head. While I’m far from being a spey casting master, I am casting farther than I ever did in the past with far less effort. And the mechanics of the spey cast have me thinking about the possibilities of water-loaded two hand casts with long keiryu and carp rods! Walleye caught at Hillsdale Reservoir on Echo SR 6-weight switch rod, 300 grain OPST Commando Head, 12’ 96 grain “Run” sink tip and a size 4 brown Complex Twist Bugger. "Fly-fishing has had enough sacred poets celebrating it already. Isn't there a good deal to be said, after all, for fishing with a worm?" -Bliss Perry, American literary critic, writer, editor, teacher, and fly fisherman. Well, what do you know? Daniel Galhardo, founder of Tenkara USA, subtly laid down his position on the Tenkara Civil War in his latest episode of the Tenkara Cast. Daniel is widely known to be pretty traditionalist in his approach to tenkara, very much influenced by his mentor Dr. Hisao Ishigaki. But he also fishes for panfish with a tenkara rod, and he calls it "tenkara." I imagine he sees this as just good business sense, because many more people have access to panfish and bass than mountain stream trout. He and his guests T.J. Ferreira (also of Tenkara USA) and Bart Lombardo from the blog Panfish on the Fly relate some good advice for tenkara panfishing. Give it a listen! I thought it would be good to show some actual keiryu as practiced in Japan. This angler is using a serious Honryu (large stream) rod, I’d guess an 8-10 m rod! My son and I made a quick half day run down to Bennett Spring State Park to test out my new Daiwa Seiryu X-45 and X-64 rods from TenkaraBum. Since this is the winter catch and release fly only season at the park, we couldn't TRULY keiryu, but we did manage to catch a few fish on flies. We started at the spring pool, where a group of scuba divers were diving to the bottom of the spring, which is apparently 80 feet down! I started with the X-64 rigged keiryu style with a size 16 Frenchie, and immediately caught the largest sculpin I've ever seen. My son, fishing the X-45 tenkara style with a size 14 tungsten bead head Utah Killer Bug, caught a sculpin right after I released mine. The trout remained unimpressed with normal sized flies, so I switched us to my go-to winter fly, the size 26 micro egg. This is nothing more than a little Senyo Laser Yarn on a Gamakatsu C12-BM with a 1.5 mm tungsten bead. I used a single tin BB shot as weight. I quickly caught two average sized rainbows. The rod handled them easily in the near still water of the spring pool. Wanting to see how the rod performed with a fish in some current, we moved downstream to a run right below a rock dam. I hooked a chunky 14" rainbow here, and while it put a nice bend in the rod, the Seiryu X-64 had no problem bringing it to the net. The micro egg, non-bead version. The tungsten bead really helps as the fly without it is slightly buoyant. Finally, some current! The upper part of BSSP is very slow water, almost lake like. I wanted to actually get a drift! With that accomplished, it was time to move on to teaching someone how to fish keiryu style. My son has a lot of experience warm water tenkara fishing, but he's never fished keiryu. The casting proved no problem for him and with a little coaching on where to cast and how to follow the drift using the markers he quickly caught a 10" rainbow on the micro egg. A few casts later he hooked and landed another. All of these fish were caught without wading, as I wanted to see how effective a long keiryu rod could be for strictly bank fishing. If you go to Bennett Spring State Park, you'll notice that people just wade halfway across the river before making a single cast. Both of my son's fish were caught within 20 feet of the bank in less than 3 feet of water. We also witnessed an example of dubious wading safety. In addition, two oblivious fly fishermen entered the river RIGHT IN FRONT OF US while we were fishing. I sincerely hope these guys don't go somewhere where people will assault you for such actions. Yes, it happens, just google "Salmon River fishing fist fight." Yes, he's holding a fish out of water. Save the hate mail, it was his first fly caught trout. It was only out of the water for about 30 seconds. Also, he subscribes to the Tanuki school of blaze orange fishing apparel. THEY'RE RIGHT HERE! WHY ARE YOU WADING RIGHT PAST THEM! You probably shouldn't do this any time, let alone January. A few other notes. I made tenkara lines for both rods, and used Nissin Oni 3.5 level line for both. While the lines cast beautifully, with that much line out even a 3.5 level line sags quite a bit. I think these rods will want 2.5 or 3 level lines for best performance. Verdict: I was very impressed with the X-64 as a keiryu rod. Set up with 4' of 1.5 tenjo line, 10' of 4x tippet as the main line and 1-2' of 6x terminal tippet with a single BB shot for weight it cast very well and quite accurately considering the "aimed lob" casting style of keiryu fishing. As soon as the regular season opens in March we will be back WITH BAIT. Bennett Spring has a bait only zone, and I can't wait to drift some red wigglers there! Keiryu-caught stocked rainbows getting ready to become "shore lunch"
Chris Stewart of TenkaraBum.com is very much my mentor in exploring the world of tenkara and related fishing methods. Most of this is largely because I read his site religiously, and whenever he posts about something like the micro egg fly, the radically simple overhand worm fly, or ultralight worm fishing I rush to the nearest water to try it out. I have also met and fished with Chris and I can tell you that he is the real deal: he loves to fish, he loves to get people interested in new ways of fishing, and he is an all-around great guy. So when I saw his latest post on his website and realized it was inspired by me I was very flattered! In the post he lays out one of the major goals I hope to accomplish here at Ozark Tenkara: I'd love to spread the gospel of keiryu fishing for trout. Many trout fisheries throughout the country have coldwaters that will support trout, but are not favorable for trout spawning. These waters are heavily stocked with hatchery rainbow trout to support "catch and keep" or "hook and cook" fisheries. People want to catch and eat fish, and I think keiryu would be an ideal method for them. As an example, let's take a look at one of the fisheries where I'd like to start a keiryu guiding service, the Beaver Lake Tailwater on the White River of NW Arkansas. When I searched for trout fishing guides for the area on Facebook, I found lots of pictures of smiling clients posing next to limits of modest rainbow trout on a cleaning station table, so there is obviously a demand for "hook and cook" fishing here. This 7-mile stretch of river is a mixed species fishery, with large numbers of rainbow trout (projected 96,000 fish for 2018) stocked to support a harvest fishery and modest numbers (6000 for 2018) of brown trout stocked to provide potential trophy fishing. 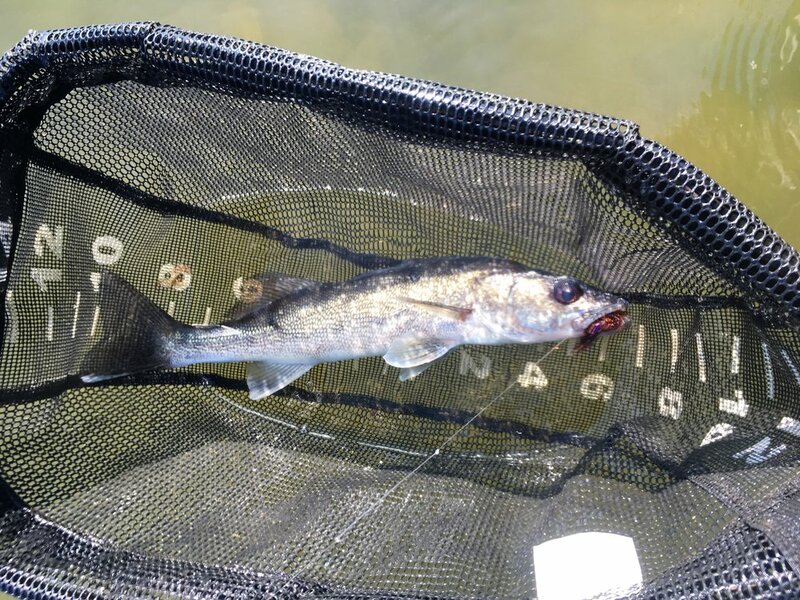 There is a special management area allowing only barbless hooked artificial lures, but the majority of the tailwater allows bait fishing with a single barbed hook. There is a harvest limit of 5 trout. Only one trout over 16" may be kept, and all trout between 13-16" must be released. Here's where keiryu comes in: the slot limit. One of the concerns regarding bait fishing and catch and release is post-release mortality rate. The classic slip-sinker and Powerbait rig is very likely to result in deeply hooked fish. The same is true of 3-way drift rigs. With spinning tackle and passive fishing tactics, the angler often has a great deal of line out. By the time the angler realizes a fish has taken the bait and sets the hook, the bait could be halfway down the fish's esophagus. Given the modest size of the average trout in this fishery (a 2010 electrofishing survey found that 70% of the trout in the system were in the 11"-13" range), I think the longer length (4.5+ m) seiryu rods would be better suited to the task than more robust keiryu rods. My concerns are rod weight, cost, and "fun factor." I want a light rod that won't wear out a client, that doesn't cost an arm and a leg, and provides an exciting fishing experience. While there are relatively inexpensive long keiryu rods like the Nissin 2-Way Yu Yu Zan series, these rods are relatively heavy. There are very light long keiryu rods like the Suntech Kurenai Long 61, but these rods are much more expensive. As for fun factor, a modest rainbow trout will put up an exciting fight with a long seiryu rod. But what about the occasional "big" fish? Chris Stewart's fishing buddy Coach says we often underestimate the ability of a long soft rod to subdue sizable fish. I've seen pictures of impressive fish Coach has caught with the seemingly very delicate Suntech Kurenai HM39R seiryu rod, and I've tangled with and landed a few good-sized fish (including a 10" smallmouth bass that may have provided the single most exciting fishing experience of my entire life) with the even shorter Kurenai HM30R, so I think that the very affordable, light, and slightly more robust Daiwa Seiryu-X rods (rated for 5x tippet instead of 6.5x) in the longer lengths should be ideal for this fishery. You may not land every one of the 16+" fish, but you will certainly have a very exciting fight on your hands. I have Seiryu-X 45 and 64 rods in shipment to me as we speak. Testing will commence as soon as my schedule permits! I caught this fish on a tenkara rod, with a fly. Is this tenkara? "NO, WHY DO YOU DEFILE OUR SACRED SPORT AND DISRESPECT THE JAPANESE SENSEIS IN SUCH A MANNER? THIS IS NOT A TROUT. THAT IS A POND, NOT A RIVER. AND THAT KILLER BUG? THAT'S NOT A TRADITIONAL KEBARI! YOU ARE NOT FISHING TENKARA!" You must use a tenkara rod with a proper cork, wooden, or foam grip. You must use an unweighted kebari of traditional Japanese design, or inspired by such. You must be fishing a creek, stream, or river. Fishing for bluegills in a pond with a seiryu rod and a fly. Stream fishing for smallmouth bass with a tenkara rod, a floating line and a Sneaky Pete. Chucking Clousers for hybrid bass with a fixed line carp rod. Czech nymphing with a keiryu rod. Any fishing with a fly and a Japanese fixed line rod that isn’t for stream trout. The problem with Tenkara Fundamentalism is that for vast swaths of the US, trout fishing in streams is simply not an option. I would love to be able to drive 10 minutes to a trout stream, but my reality is that I have to drive at least 3 hours to get to one. We want to grow our sport, but putting it in such a tightly walled little garden isn’t going to help. Of course, this is old news to any serious fly fisher. More than any other group of anglers, fly fishers LOVE to tell other anglers that they’re fishing the wrong way. Indicator nymphing for steelhead? Might as well be throwing dynamite in the river! That’s not a fly, it’s a lure! Tenkara? That’s a fad for hipsters fishing for dinkers. Me, I only toss 10” streamers for 20-lb browns! Also, look at my awesome beard and trucker hat. I have a fragile ego and a need to feel superior to the unwashed masses. Do you have the appropriate permits/licenses? Are you following the regulations? I actually enjoy fishing the Tenkara Fundamentalist way. In the right setting, it’s incredibly fun and effective. And there is a lot to be learned from the Japanese masters. But more often than not you’ll find me fishing Un-kara, simply because that’s what is most accessible to me on a daily basis. Don’t worry about the Facebook warriors. Just go catch fish and have fun! Bait fishing. When you're around fly anglers, those two words are often spoken with a certain tone of voice imparting the sentiment "bless their dear hearts they haven't become fully enlightened 12th-level aqua mages like us fly fishers." I'm a fly angler through and through. I also fish with bait. FOR TROUT. OK, I hope you've recovered. I am not above soaking Powerbait to catch some stocked rainbows for the frying pan in put and take cold season lake fishing. But what if I were to tell you that there is a very effective active bait fishing method more akin to fly fishing? And what if I told you that this method even makes catch and release possible with bait fishing? Such a method does exist, and it's called keiryu fishing. Keiryu means "mountain stream" in Japanese, and is much more popular than tenkara in Japan. Like tenkara, keiryu rods are fixed-line fishing tools. The difference is that keiryu rods are designed for fishing with weight (usually split shot) whereas tenkara rods are designed for fishing unweighted or lightly weighted flies. The bait can be anything: red wigglers, meal worms, salmon eggs, even aquatic insects collected from the stream you're fishing. Just as in tenkara, the essence of keiryu is the drift. Keiryu lines are often quite light (4x or smaller tippet material), and for good reason: eliminating line sag. This keeps the main line off the water so that drag is minimized. However, this thin line is often very hard to see so some sort of indicator is needed to detect takes. Unlike conventional fly fishing indicators, keiryu markers are suspended above the surface of the water. Keiryu indicators are usually small sections of brightly colored synthetic yarn, tied to the main line above the line/tippet junction. It's best to use multiple markers a few inches apart for maximum visibility and sensitivity. It's the sensitivity that makes keiryu compatible with catch and release fishing. When keiryu fishing with a tight line, even the lightest takes will show up via the indicators as a dip or movement to the side. All you have to do is lift the rod tip to set the hook. The quick strikes result in almost all fish being hooked exactly as they are when fly fishing. Just as in fly fishing, there are the rare instances of deep hooking, but nothing like the gut hooking you get from bottom fishing with bait. If this sounds to you to be a lot like Czech nymphing with bait, then you're on to something. Keiryu rods make excellent nymphing rods as well, in fact much better than most tenkara rods. That is a topic for another post.